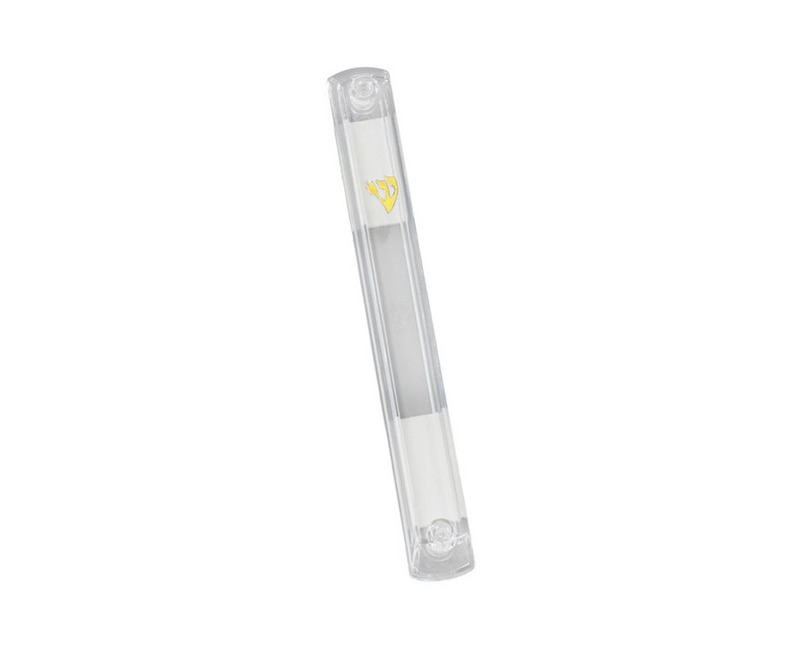 This standard clear Lucite mezuzah holder will hold your mezuzah parchment in place and enable the mezuzah parchment to be seen from the outside. The case is decorated with a gold colored “Shin”, the Hebrew alphabet letter that represents G-d’s name as a guardian of the home. The case is made from two parts, the holder and a back cover that detaches, allowing easy placement of the parchment. The case has two holes on each end allowing it to be easily affixed with nails to the doorpost. The mezuzah holder comes with double sided tape on the back cover to hold the holder in place while nailing onto the doorpost. The case is available in different lengths to accommodate different mezuzah scroll sizes. The mezuzah parchment scroll is not included.